Just along the coast from St. Tropez, Port Grimaud is a chic village purpose-built in the 1960s by architect François Spoerry. The town was designed to resemble a mini Venice with its network of canals and brightly painted buildings, and today it is a popular destination for visitors to the Côte d’Azur. Port Grimaud is a unique place, arranged over four islands surrounded by canals and connected by bridges—hence it being known as the Venice of Provence. The whole village was designed and built in the 1960s on former marshland west of the glamorous town of St. Tropez. The majority of homes are simple in structure and resemble the traditional fisherman’s cottages of the area. The virtually traffic-free village attracted controversy for being a “fake” version of a Provencal town when it was first built, but now it’s a popular destination for both homeowners and visitors. The modernist church dedicated to St. Francis of Assisi, with stained glass by Victor Vasarely, is on most people’s must-do list, as is a boat trip along the canals to see the many different watercraft—every house in town has its own private mooring. For many travelers, Port Grimaud—often as part of a small-group or private guided tour out of Nice, Cannes, Monaco, or St. Tropez—is a highlight of their Provence visit. The town hosts a weekly produce market on Thursday mornings and a flea market on Sunday mornings. On Mondays during high summer, the town also holds a popular night market. You’ll find a variety of shops, restaurants, and cafés here. Get a unique perspective on the homes in Port Grimaud with a boat trip along the canals. Port Grimaud lies along the Côte d’Azur, 7 miles (12 kilometers) southwest of St. Tropez. The closest airport is in Nice, 55 miles (88 kilometers) away. Cars are not permitted inside the town and must park on the outskirts. You can use local water buses to get around town, or explore with a guided tour. Port Grimaud is lovely year-round, although it’s busiest during the summer months. Opening times differ for the different stores, cafés, and restaurants in town. Known the world over as a favorite vacation spot for the rich and famous, the French Riviera town of St. Tropez has everything you could want for a day on the Côte d’Azur—gleaming white superyachts, very chic boutiques, stylish beach clubs, and bistros offering glasses of ice-cold rosé with stunning Mediterranean views. Experience the beauty of Saint-Tropez and Port Grimaud on this full-day tour from Nice. Learn why the seaside town of Saint-Tropez has long attracted international visitors as you enjoy its beaches, art, and sunny climate. Explore the lesser-known but equally charming Port Grimaud, designed in the 1960s by architect François Spoerry. Bask in the unique allure of Saint Tropez on a small-group day trip from Nice. Gaze at luxury yachts, shop in trendy boutiques, pause for a sip in a terrace cafe and enjoy lots of fabulous people-watching. Spend a day in captivating St Tropez on this small-group day trip from Monaco. Take in the stellar views along the Esterel Corniche road as you travel west. Visit Port Grimaud, sometimes called 'Little Venice' for its canals and bridges, on the way to St Tropez. Arrive in fabled St Tropez to explore its sparkling waterfront, grand public squares, chic shops and atmospheric cafés. Watch expensive yachts float in the water off the coast. Check out the Provencal market in Place des Lys (Tuesdays only). Group size is limited to eight people to ensure a more personalized experience. Synonymous with celebrities and the jet set, Saint-Tropez lies about 60 miles (100 km) west of Nice along the French Riviera. See what all the fuss is about for yourself on this day trip that sweeps you along the Mediterranean coast and provides free time for you to explore the upscale town at your leisure. St Tropez is among the most glamorous destinations of the French Riviera, but its VIP resorts and luxury yachts carry a price tag to match. A more convenient choice is to visit on a day trip from nearby Nice – this private full-day tour takes in all the highlights, including the lively harbor, beautiful beaches, and historic citadel. With its golden beaches, glamorous nightlife, and celebrity yachts, St Tropez is undoubtedly the star of the French Riviera. On this tour, benefit from a small group size and enjoy a more personalized experience. Visit both St Tropez and neighboring Port Grimaud, explore the towns both with and without your guide, and enjoy stunning views along the Cote d’Azur. Customize your private tour of the Provencal villages of Saint-Tropez. With a dedicated guide and your private party, visit Ramatuelle, Gassin, and Port Grimaud. Learn about the culture, history, and architecture through a guide's engaging commentary as you travel in a private vehicle. This private tour ensures personalized attention and guarantees a flexible itinerary. See the sights of the French Riviera on this privately guided, full-day tour from Saint-Tropez. Perfect if you’re seeking a more flexible excursion, the tour can be personalized as you wish: Discover a beachside restaurant at Plage de Pampelonne, taste wine at a local wine estate, or check out the villages around the Saint-Tropez peninsula. You’ll learn about the region as you travel from your own private guide. Explore glamorous St. Tropez—a French Riviera resort town that’s famed for its star appeal—on this seamless, small-group tour from Nice. 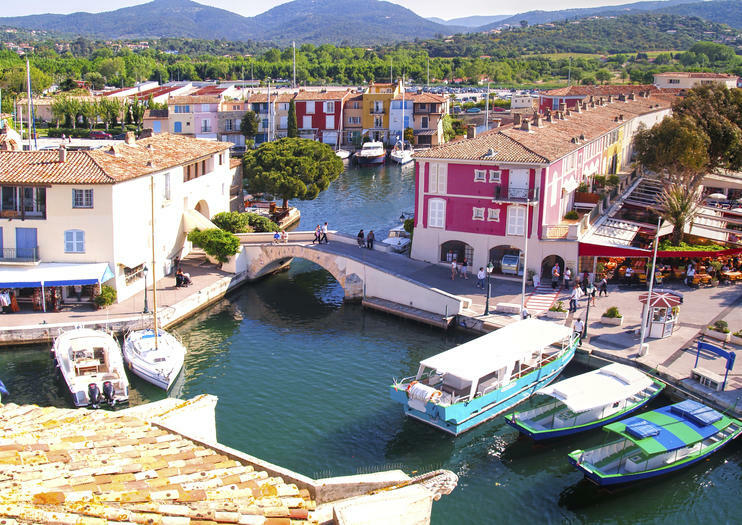 Following pickup from your accommodation, travel by air-conditioned vehicle to Port Grimaud: an elegant village that’s often described as the Venice of Provence, thanks to its picturesque canals. Then, continue to St. Tropez. Hop aboard a vessel (additional expense) for an overview of the town, and to spot the villas and yachts owned by the rich and famous. Discover the gem in southern France’s crown on this 8-hour St-Tropez day trip from Cannes. Travel through the Maure Forest to seaside St-Tropez. Visit the Annonciade Museum, home to beautiful 19th- and 20th-century art. Explore the 17th-century citadel, and enjoy free time to soak up the rays and watch boats bobbing in the harbor. On route home, visit Gassin village and conclude by a wine tasting at Château Minuty. Enjoy personal attention from your guide on this small-group tour, limited to eight people. The best way to discover all magnific sights of the French Riviera. Choose from a variety of tour duration options. 1 Day to visit the famous places of the region as Monaco Monte-Carlo and Cannes. Book a second day to visit the french riviera villages and countryside and get 5% discount and an airport transfer from Nice . Have the possibility to add a 3rd day to travel to Italy for the italian market in San Remo and we'll offer you 10€ discount and Nice Airport transfer Roundtrip. For the 4-days option, you will visit one of the most luxurious cities of the French Riviera, Saint-Tropez. A Boat Experience will be included in the tour to discover the splendid Mediterranean shores and cross the glistening waters of Saint Tropez gulf. furthermore, you'll get 10% off and Nice Airport transfer Roundtrip.